So you've just got your brand new DS console and you can't wait to get playing? We'll the last thing we want to do is spoil your fun, but there's one little thing you might want to consider first. 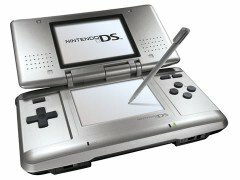 The DS is a touch screen console, as you are no doubt aware, that means you're going to be spending a lot of time doodling on the bottom screen with your stylus. In fact, some of the more manic games will have you scribbling and scraping frantically. Some titles are played better by using your fingers on the touch screen, great for convenience, not so great for keeping your DS looking like new. Fortunately however, there is a solution. Screen protectors are readily available for the DS and DS Lite. A screen protector is simply a layer of thin transparent material that sits between your touch screen and the stylus, protecting it from wear and tear. If the screen protector becomes scratched, it can be replaced easily, unlike your DS's screen which can be quite expensive to repair! A good screen protector won't affect the touch screens responsiveness either. Even if you've had your console for a while, it's not too late to consider a screen protector, do it now before your screen gets any worse! There are several brands of screen protector on the market, our favourite has to be the Hori screen protectors. These are the official Nintendo approved screen protectors in Japan, and in America they are available as "Hori Protective Filter DS". If you live in Europe, many e-bay sellers import the Hori screen protectors from Japan, or, if you prefer, you can import them yourself from Play-Asia.com. 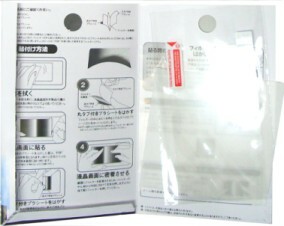 Like most screen protectors, the Hori screen protectors come as a pair, with one cover for each of the screens. While you're not going to be scribbling on the top screen, it can't hurt to put a screen protector on that screen too, especially seeing as the Hori screen protectors include special anti-glare coating to improve visibility. Care must be taken when applying a Nintendo DS screen protector. If you trap air bubbles underneath the screen they will interfere with game play, so take your time and keep the air bubbles to an absolute minimum. We've found the best way to apply a screen protector is to get someone to help you during the process. Firstly, thoroughly clean your DS's screen (Hori include a cleaning cloth in with their screen protectors). Then, gently peel back the first part of the backing on the screen protector and position it carefully on the DS screen. Now, without touching your DS screen with your fingers, slowly start to peel back the rest of the backing, while the other person uses a dry, lint free cloth to firmly press down the screen protector and work out all of the air bubbles as you go. Once the screen protector is applied, smaller air bubbles can sometimes be worked out by gently pushing them to the edge of the screen using your cloth, but remember not to push too hard or you may damage your DS's screen. Ok, You Can Start Playing Now! So, does the Hori screen protector affect game-play? In our experience, absolutely not! The touch screen remains as accurate and responsive as ever and there is no need to apply additional pressure to register a press on the screen. The protectors are durable too, my DS Lite has been subjected to some manic sessions on Wario Ware and Elite Beat Agents with no visible degrading of the screen protector taking place. While I've not removed my screen protector (why would I?) reports from other DS fanatics on the web say that it leaves behind no sticky residue, so come time to change your screen protector, you should have no problems. The only thing left to do is give those screen protectors a good old work out while you play all those great DS games!